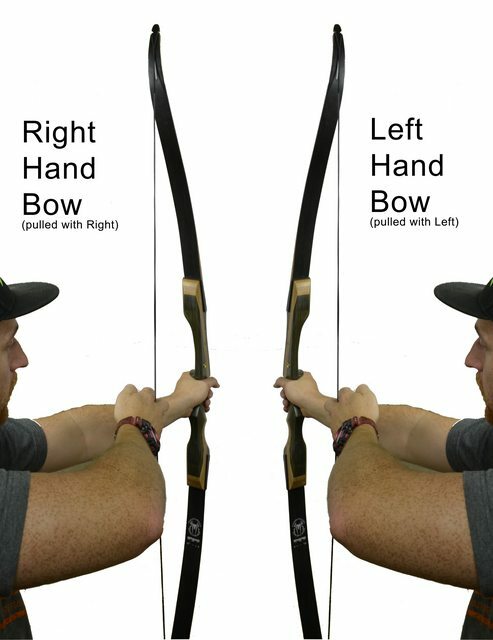 Do I need a Right Hand or Left Hand Bow? Great Question! Its kinda confusing because its sort of backwards, you hold a RH bow in your Left hand and pull with your Right. In contrast you hold a LH bow in your Right hand and pull with your Left. Most people think the hand you write with is the one you should pull with, this is most commonly true but what you really want is your dominant eye. Check out our Video Page for a walk through on how to find your dominant eye! What is the draw length of this bow? The draw weight of the Spyder is measured at 28". However you can pull the bow as far as you need for your draw length, if you pull more than 28" it will add about 2.5 pounds per inch over. It will also decrease about 1.5 pounds per inch if your draw length is less than 28". How do I know what arrows to get for my bow? Picking the correct arrow is the most important aspect of shooting well. Arrow Spine is how much a arrow will flex based on the force exerted on it, however this differs based on arrow length. Fortunately all arrow companies have a spine chart to help us get the perfect arrow! The problem with arrows is everyone needs different lengths, and its impossible to add length to arrows once cut. So all arrows we sell are full length, which is 29-31.5 inchs depending on brand and spine. If you purchase arrows from us in the same cart with a bow we will match the spine to that bow for best arrow flight. If you are buying arrows for a different bow or just arrows separately please leave a comment stating what poundage bow you will be using them for, or comment the brand & spine from another arrow you already have. What other accessories do I need to get for my bow? In our opinion you absolutely need 4 items. A Stringer (tool used to string/de-string the bow), arrows, armguard, fingertab or glove. We also highly recommend a Bowcase to protect your investment, an upgraded arrow rest (will give you better accuracy from the get go), a sight (not everyone uses one but they do help), and a side quiver or bow quiver. If you plan on hunting you will want a bow quiver which mounts to the bow and hold the arrows snug without any movement. If you just plan on recreational shooting then you may prefer the side quiver as it provides easier access to your arrows. We also have some sweet back quivers! Would this bow be good for bowfishing? Yes it would work great! We sell a bowfishing kit with the rest and arrows you will need. You will also need a reel. Our bows are designed in South Korea, and the manufacturing factory is in China. A strict Quality Control is in place and overseen by Korean staff members. Yes! Shipping around the world is very variable. Please contact us with your shipping address and the items you are interested in for a shipping quote. We ship same Business day if ordered by 9 am, otherwise it will ship the next Business day. Will I be charged for taxes? If you live in California you must pay taxes on the cost of the items only. We all could use an extra day. Every item we sell is covered by our 91 day return policy. If your new, unused* item doesn’t work out, you have 91 days to return or exchange it. Simple. *All items must be returned in original condition, including manufacturer packaging, tags, documentation and any accessories. We do not accept used items, but we are happy to help you with any manufacturer defects and warranty replacements. Returns that show signs of use or missing parts will be assessed a 30% restocking fee. The easiest way to exchange your new, unused item is to initiate a return and place a new order through our website. This will allow you to get your new item quickly and avoid the risk of it selling out. You will receive a full refund for your item once we receive the return. Feel free to contact us to set up your exchange or answer any questions. Items will be refunded infull within 72 hours of receiving as long as item are received in new condition with all included accessories. What are your warranty terms & conditions? Each new product sold by Southwest Archery or our approved dealers, will be covered by our 1 year warranty. This does not cover damage due to dry-fire or misuse. *Shipping on warranty claims is the responsibility of the buyer. Used and demo products are sold "as is" and do not carry a warranty.